Researchers at the Universities of Warwick and Cardiff have used a combined powder XRD, solid-state NMR and computational approach to determine the structure of 3',5'-bis-O-decanoyl-2'-deoxyguanosine. A combination of experimental and computational methods has enabled researchers to establish the structure of one of the most challenging organic materials than has been determined to date based on the analysis of powder X-ray diffraction (XRD) data. However, using only powder XRD data, the crystal structure of the 90-atom molecule 3',5'-bis-O-decanoyl-2'-deoxyguanosine [denoted dG(C10)2] is challenging to determine due to its size and complexity, which makes the structure determination process particularly complicated. Reporting in the journal Chemical Science, researchers – including Professor Steven Brown from the University of Warwick's Department of Physics, Professor Stefano Masiero at the University of Bologna and led by Professor Kenneth Harris from Cardiff University - augmented the powder XRD analysis of dG(C10)2 with information derived from solid-state nuclear magnetic resonance (NMR) data and dispersion-corrected periodic density functional theory (DFT) calculations for structure optimization. This combined approach using experimental and computational methodologies enabled the team to successfully establish that dG(C10)2 forms a hydrogen-bonded guanine ribbon motif that has not been observed previously for 2'-deoxyguanosine derivatives. The dG(C10)2 molecule is currently used in photoelectric devices, including photoconductive materials, biphotonic quantum dots and photodetectors with rectifying properties. In all these applications, the structural arrangement of the guanine groups is a key factor. It has therefore been particularly important to understand the preferred structural properties of dG(C10)2 in the solid state. It is anticipated that the synergy of experimental and computational methodologies used in this research will become an essential feature of strategies to further expand the application of powder XRD as a technique for structure determination of organic molecular materials of even greater complexity in the future. "Understanding structure with atomic resolution is key to establishing structure-function properties. This work considers a nucleic acid derivative which has promise for application in electronic materials," explains Professor Steven Brown. "Solid-state NMR experiments carried out over 10 years ago at Warwick had identified the formation of specific hydrogen bonds between the molecules. 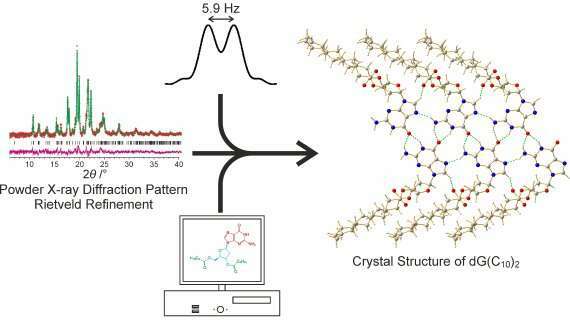 This complementary information was essential to the Cardiff team's success at determining the crystal structure from experimental powder X-ray diffraction data that was verified by the excellent reproduction of experimentally measured NMR parameters for the derived structure density-functional theory calculation. "This tour de force NMR crystallography effort for this very challenging system revealed an unexpected self-assembly that had not been seen before for the class of compound (2'-deoxyguanosine derivatives)."